"Where are your scary books?" "Do you have any books like Twilight?" "Where are all the mythology books?" After nine years as a school librarian, I have been witness to many, many students rushing into the library asking these questions. Bearing library passes with precious few minutes before they must return to class, middle school students often do not have time to mull around or search the catalog to figure out what books to get. They may not have a specific author or title in mind, but almost every student who comes in knows what type of book (genre) he or she wants. For nonfiction books, the Dewey Decimal system accounts for genre naturally. 796 is sports. 398 is traditional literature. 940 is European history. But fiction sections, by far the most popular section in my middle school library, are traditionally organized alphabetically by the author's last name. And while I'm sure it's happened, I can't think of one time a student has rushed in, asking me where all the books by so-and-so author are located. The fact is, the kids don't usually know or care who the author is. They just want a paranormal romance before the bell rings. Last January, I attended a workshop at our regional education service center. One of the sessions was about genre-fying your library, presented by a local high school librarian. The librarian told us about how she genre-fied her fiction section and the enormous increase in circulation her library saw as a result. Her enthusiasm and simple step-by-step instructions inspired me to do it myself. So while the original idea is not my own, I wanted to share it on my blog for other librarians who have ever considered genre-fying their fiction section. Students can find the books they want more easily. Our number of items circulated has nearly doubled over the same three-week period last year. Books are organized the way students look for them. This is also consistent with many book stores. We can instantly identify holes in our collection. After only three weeks of our project completion, I have already ordered more books for the horror section. It's been ravaged. Paranormal, Sports, Humor, and Chick Lit/Romance also need some attention. Fantasy, realistic fiction, mystery, and historical fiction sections do seem pretty sufficient for our readers, so they are not the priority at this time. I am a fan of anything that makes shelving easier, and this project definitely does that for the Fiction and 741.5 (graphic novels) sections. We can also identify a book in the wrong section immediately. My six-year old sometimes walks around after school and pulls out the ones in the wrong section. Easy-peasy! I now have no doubt that my students can easily define "genre," a state-tested term for middle school language arts. I would bet money that most--if not all--of our students can also name several genres without even breaking a sweat. Now when a student asks me "Where are all your scary books?" I can smile sweetly and say they're right here. Next question! Aug. 22 - Sept. 9, 2011 2,310 = 1,098 more circulations over the same period last year! The students are excited about being able to find what they want quickly, and as a result, our circulation statistics over the same period last year nearly doubled. For the first time since we opened our campus three years ago, all of our sixth and eighth grade literature teachers began the school year with a major genre assignment, using the library's new genre categories as the guide. I actually saw eighth grade English classes as a group outside their library orientations! Make a list of the genres you want represented and the colors you want to use for each genre. Think about what books your students ask for, and how they ask for them (the terminology they use). Consider also what your teachers might need for their classes. For example, one eighth grade teacher at my school does a short unit on narrative nonfiction every year, which could be its own genre section. We ordered our supplies from Demco and Highsmith. You will need several rolls of book tape and color-code labels to match the genres you chose and the estimated number of books for each section. Be sure also to order at least 1-2 extra rolls of color labels and tape because you will also have to genre-fy new books as you receive them. I have also discovered that Amazon has a lot of different color selections. This is beneficial if you want many different genres I have 18 genres now, and finding 18 colors that didn't look too similar to each other was not easy. In researching sources for more label colors here in China, I found the labels below on Amazon. The first link (the one to the far left) includes 26 different colors, including matte silver, matte gold, shiny silver, and shiny gold. As a librarian in China my label colors have been limited here, so I plan to buy these when I go home this summer. We are planning to add one or two new genre sections next school year--I am thinking about splitting our huge Fantasy section again, and possibly the Realistic Fiction section. I'm still working out the details and will post on it when I make a definite decision. 3. DECIDE HOW YOU WANT TO DESIGNATE EACH GENRE IN YOUR CATALOG. Our school district circulation system is Destiny. We decided to put the section name in front of the existing call number for that book. For example, Brandon Mull's Fablehaven previously had a call number of FIC MUL. We changed the call number to FANTASY FIC MUL. Another librarian in our district (inspired by the same workshop I attended) put the color code in parentheses after the call number instead. For example, The Red Pyramid by Rick Riordan would be FIC RIO (red/white). Another possibility would be to put the genre name in the Sublocation or Copy Categories fields in Destiny, which would enable librarians and students to print book lists by genre. It does not really matter what your circulation system is or how you decide to do it. The most important thing is that you are consistent and your patrons can still find the books they want easily. 4. PICK UP A BOOK AND START GENRE-FYING. --Look at the cover and read the blurb. --Decide on a genre. For some books this will be obvious just by looking at the cover art. Other books will require some investigation. If in doubt, consult circulation catalog, Goodreads, Amazon, BN, students, other librarians before picking a genre. --Put the color label on the spine. Cover it with book tape so it stays on. --Change the call number and/or sublocation and/or copy category in the catalog. You'll still need to be able to look up the book in the catalog and find the it in the library! --Shelve with the genre section once they are created. My aide and I and about 10 eighth grade students worked diligently every day for four months on this project. Library life continued throughout those four months. We never closed as a result of the project, and our schedule went on as usual. If anything, we were busier than we had been before because students and teachers were curious about what had changed since the last time they came in. Yes, it took a long while, but we really, really got to know our collection, and all of us involved ended up discovering new books to read and recommend. Truth be told, it was actually kind of fun. At times, we got stuck. Many books could easily fall into more than one genre category. We turned this into a lesson for all our students by putting a sticky-note on those books, listing 2-3 genres we thought would fit best. We kept these books on a table with some pencils, and students in the library could read the book blurb and vote (on the sticky note) on which genre they thought it should be. Since the whole point of this project was to help students find books where they were looking for them, the genre receiving the most votes for that book was the one that stuck. This was also our sneaky little way to get students school-wide reading lots of different book blurbs! 5. START CREATING YOUR SECTIONS. In my library, we created our genre sections as we went so that all our students could observe our progress and really take-part in the project. To do this, we color-coded all the books on six of our shelves. Then, we removed all the books from those six shelves and sorted them by color on tables. We then replaced the books into the cleared shelves, organizing them by genre this time. The other librarian in our district labeled all her fiction books first, then reorganized them at the end. Her process saved her a couple of weeks of time, so if you are wanting to just get it done, this is probably your best bet. If, however, you want your students to see the process as it goes, I recommend moving the books as you go. It did take us a little longer and required lots of moving and shuffling of books, but our students were really buzzing about the project. Our literature classes are scheduled to visit as a group every two weeks, and the kids loved seeing how the library had changed since their last visit. Sections were relocated (due to changing shelf space needs) lots of times, and a student visiting the library twice in the same day might see a very different layout both times. It is also important to note that most of our library shelves are made of heavy oak, but they have wheels on the bottom and are mobile. This enabled us to change our library layout to suit the size of our genre sections. Librarians with immobile shelves may want to house similar genres side-by-side in the same area. Also, this project requires lots of lifting of books and moving of heavy shelves. My aide and I are both healthy and in good physical condition, but we still recruited students when we needed help moving heavy shelves or reshuffling large numbers of books. This was a great job for our eighth grade football players, who were always happy to help, and it brought them into the library. Win-win! 6. LABEL YOUR SECTIONS CLEARLY. Since the library layout and book locations may change daily as you genre-fy, be sure to label sections clearly with signs and/or pictures that compliment the genre colors you chose. Make sure students and teachers know what you are doing. Provide weekly updates on the school's announcements. Remind students that they can come in to help during lunch or before/after school. Post photos of your progress to your library web page. Advertising your project will generate interest and help to grab those kiddos who don't often choose to visit the library on their own. QUESTIONS? COMMENTS? DID YOU GENRE-FY YOUR LIBRARY? If you have questions or comments about genre-fying your library, please post a comment! I monitor my blog daily, and I promise to respond quickly. I would also really love to know who else has genre-fied and how your experience went. What an awesome idea! I'm going to let our middle school librarian know about this. She may already do this, I haven't investigated the shelves as much as I've talked books with her. But this is a great idea. I wish the public libraries did this in the YA section! I totally agree! I am hoping that step-by-step instructions will inspire others as much as it inspired me. Other than a few months of hard work on it, I just can't see why this wouldn't catch on. I'm almost tempted, and will think about this. I do a lot of genre displays, which takes care of students who are in a real rush. Hmmm. There is never enough horror, is there? And why do middle school students want to read about murder? There's a section that I wouldn't want the superintendent to come in and see! Great job on increasing circulation. 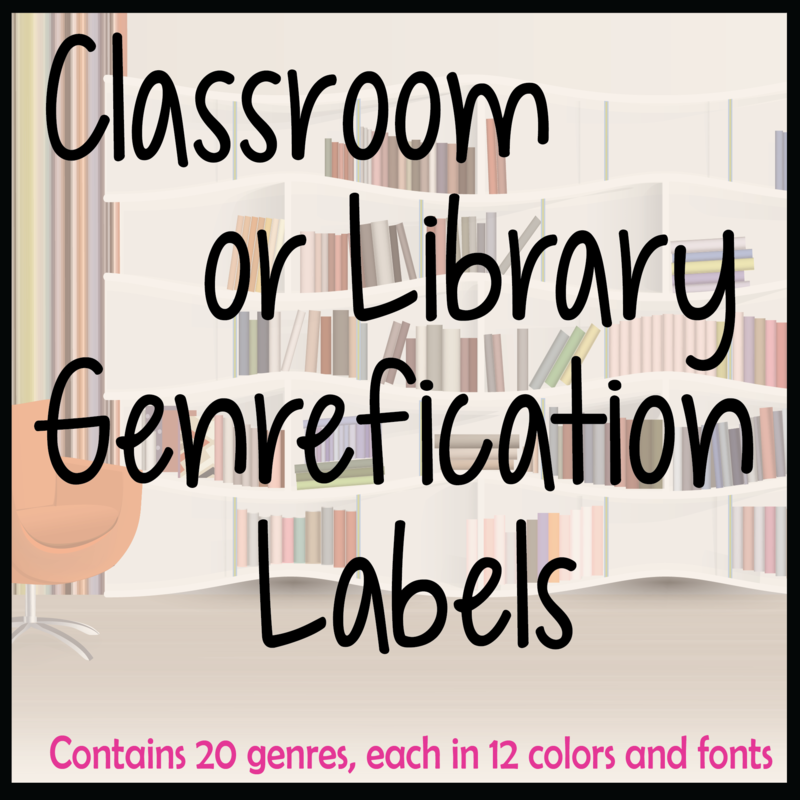 My library has been a mess!Sooo..I had my kids help me put my 3rd grade classroom library into genres! We had it in AR groups, but that didnt see to be getting them to read. I am hoping next year genres will inspire them to read what they like! I found some tick tac toe games and a graph of the type of reading they have done during the month also. I hope to increase the different type of reading the kids do and not just the number of books. Thanks for showing the way! I'm so glad to have found your post. I'm working on organizing my classroom library. I inherited 100-200 books from a retiring teacher. As a new teacher this is such a blessing. I teach special education for students in grades Kinder-Third. It will be important for me to not only sort my books by genres, but also level them as much as possible for independent reading time. I see, though I'm very scaled down, that I've taken a similar approach. This is reassuring. Our sixth grade literature teachers recently genre-fied their classroom libraries as well. They labeled flat plastic baskets from the dollar store. I know they used different colors to represent genre as well, but they did it on a smaller-scale than we did. You can also buy (or ask your librarian if she will donate) some book cards and book pockets. When a student "checks out" a book, he/she signs the card inside the book and puts the card in a designated place. After much discussion with @libraryfanatic and @gopherlibrarian, I started genre-fying this summer. It is such a long process! I hope to have students help me once school starts. I'm going to document more so that I can show the benefits to admin and staff. Thanks for your step by step! @KB--Congratulations! Yes, it is a long process. 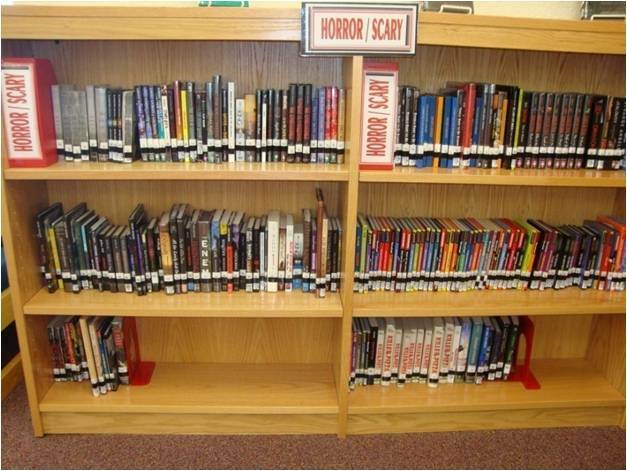 Just know that when it is finished, you will save time shelving fiction books and showing students where the scary books are located. And your circulation will improve dramatically, which means more students reading! I need to do a 1-year later follow-up post with a circulation stats update, impact to other district libraries, 3 new genres we plan to add this year, and a change we made in the call numbers. So much to do, and school starts for me in TWO weeks! We are getting ready to jump on the genre organization band wagon. My associate and I love your post and appreciate the insight! I'm really curious to know the 3 new genres you plan to add and the call number change. I'm also wondering what size color labels you ordered...we can't wait to start the journey! 4. What kind of books are you putting in the Realistic section? Do have specific criteria in mind? I really want to get moving on this, but this little issues are tripping me up. I will look forward to your response. @Anonymous--Thank you for commenting! I think you asked some great questions that many others will benefit from, so I answered them in a new post-- http://readerpants.blogspot.com/search/label/answers%20to%20genrefication%20questions. I am an elementary K/1 librarian. We have 300 students, 7 years and younger. I would like to change our library to subject such as "trucks", "cats" etc. Has anyone done this? What steps did you take to change? I am the only person in this library, with 24 classes per week and other school duties. My nonfiction section has milk crates on the bottom row of each shelf where common subjects can be tossed in to make easy for our little ones to find. Each crate is labeled with its subject-- trees, penguins, football, planets (just to name a few!) It helps the kids and it makes the nonfiction section a million times easier to shelve. I also use the same technique in my beginners fiction section, but I use smaller bins since the fiction books are generally smaller. I genre fyed by library too. And the kids to love it. I just have too many Genres and was thinking of putting Adventure and Realistic Fiction together but have different stickers on them. I have not colored coded yet but I am going to start. And you are right. My mysteries is really low. I need to get somemore of them. Thank you for your advise. I am just now starting the genrefication process in my elementary library. Figuring out where to put the genre's is my dilemna right now. How did you figure out where to put what genre? Also, I would definitely recommend only genre-fying fiction since Dewey is sorted by genre by design (NF cats are 636.8, so they are all together already). I do not recommend shelving fiction and nonfiction together by genre unless you have a very specific reason to do so. For example, I put my fiction and nonfiction mythology all together in one Mythology section because in Dewey, mythology was classified in the 200s, the 398s, 741.5, E, and Reference, depending on the type of book and who cataloged it at Follett. This way, it's all in one place. @Nicki C--Deciding on which sections to create (or eliminate) is the HARDEST part about genre-fying! Defining your sections will help tremendously. For example, my Action/Adventure section is kind of my catch-all for survival, pirates, and spy novels. My realistic section is for more serious topics such as divorce, bullying, drugs/alcohol, gangs, car accidents, family member deaths, etc. Defining where certain types of books go really helps to clarify the sections. @Anonymous 4:40--I assume you mean where to locate each genre in the library, which is an excellent question. A lot of that depends on how much space you have in each area. My shelves are mobile, so I can arrange them as I need. We've moved them A LOT as sections grow and change. If your shelves are immobile, it might be better to do your genre stickers and catalog changes first, then move all the books once your stickers are all on the books. Use your catalog to see how many you have in each genre and choose your space based on that. For my fiction section, I factored an average of 75 books per shelf. We have three-tiered shelves, and that gave me plenty of room to expand the section. Was the workshop led by someone in your school district? I would love more info to present to our librarians at our next meeting....love this idea! 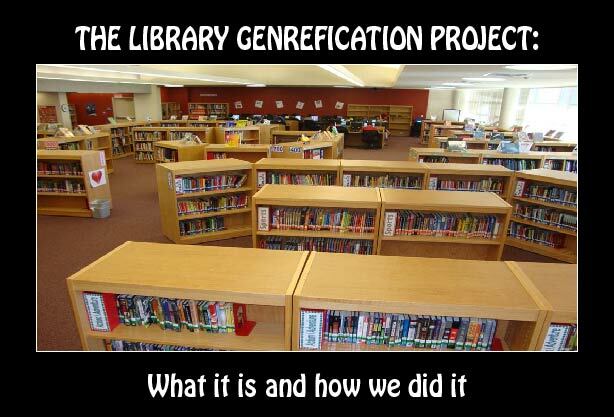 I've even read an article where librarians are redoing Dewey../have you seem that? I looked up the re-doing Dewey stuff, and wow! I am excited for anything that helps people (no matter their age) find books more easily. The original workshop I attended was at Region XI Education Service Center in Fort Worth, TX. It was presented by a HS librarian in another district. Very inspiring! Thank you soooo much for explaining this process! This is only my second year as a librarian and I have been wanting to do this in my library since the end of last year. The intermediate school librarian has already completed her library. Now I just need to start doing!!! Forever grateful. Wow I am inspired! We have a teeny tiny library and I hate the way it is organized. What do you think about putting our fiction section and easy readers together. I keep going back and forth on that. @falconsfables-- I think you should do whatever you think will work best for your library. The worst that could happen is you don't like it and end up putting it back the way it was. Thinking outside the box is how all this got started in the first place. Nothing is irreversible. Oh yes! Now I'm having a hard time figuring out Fantasy, Fairytale and Mythology. Part of me could put them all together and another part wants to maybe have at least two sections. Care to share your definition of each one? @falconsfables.org-- I responded to your question on the Answers to Reader Questions About Genrefication section of my blog. If the link doesn't work, go to the Genre-fication tab at the top; right now it is the second link on that page. @Anonymous--I posted your answer here. I am interested in knowing how the teachers feel about this change? Do they know where to go to find a book? @Anonymous--We actually change the call number of the book in the catalog to reflect the genre. For example, before genrefication, Gary Paulsen's Hatchet was previously FIC PAU. Now, it is ACTION PAU. The call number works the same way it always has--section + author last name; we just changed generic FIC label to the name of the specific genre section. The important thing is that patrons know how to use the catalog to find books, no matter what system the library uses to classify those books. Even genre-fied, our catalog works the same as every other library's catalog. Even before our genre-fication, most of our teachers just asked me where books were located--the teachers are usually in a hurry, and asking me for help is easier and usually faster. I have had tons of positive feedback from our teachers and our students. Genre is a state-tested concept in middle school, and I have no doubt at all that my students know it well after their first couple of library visits. It truly makes materials easier to find, and our circulation shot way up since we genrefied. Here's a link to see the stats on the increase in circulation. I'm trying to do something VERY similar to this in my classroom library. The genre-fication part tricks me up every time... What is your biggest indicator in the difference between fantasy and adventure? Most of my books have personification in them, so does fantasy trump adventure? Thanks for your help! Wow! I am pretty excited that my Genre-fy Your Library presentation sparked your enthusiasm this much! It really is great when others see the positiveness of putting the collection into genres will do. Thanks for spreading the word and being an awesome librarian yourself! Tammy! Yes! It was your presentation that I mentioned in my post! I did it along with another MS librarian in our district. It has made the BIGGEST difference in our library, and it really did all originate with your presentation. Thank you so much for sharing! I did something similar at my library. Instead of all my books - I did only series books. So far, so good! Thank you so much for this fantastic idea! Your library looks great! I was wondering what you used on your shelf for the signs? Are those boxes? I did a post awhile back about these sign holders--got mine from Demco (they definitely still have them; I just ordered more this summer and received them a few weeks ago). Here's the post. What are your thoughts on genre-fying to also include non-fiction titles?? With Common Core beginning to come into focus, this is something I am considering... It would be amazing if a student found a fiction title right next to a same topic non-fiction! Say a historical fiction title about WW2 next to the non-fiction companion with World War 2 facts! Thoughts??? @Laurie--Definitely an interesting idea! I do have my mythology nonfiction shelved in my Mythology section (so it includes both FIC and Dewey # mythology, side-by-side). I also have some 133.1 shelved in our Horror section. It started out as an experiment to see if checkout of the NF improved, and we've kept it that way for these two sections. I think it could also work for my Fairy Tales Fiction section (put 398.2 with FT spin-off novels). Sports NF in the Sports Fiction would be a similar idea. So, yes, I think this could work in certain sections. There are people who will disagree and say that all libraries have to be the same (also a valid argument), but I've always said that WHERE we shelve doesn't matter as much as CAN USERS FIND the books. Online catalogs work the same way for the most part, so users being able to look up and find the book is the important thing, regardless of how the library is organized. Hi! I am just starting to purchase supplies so that I can genrefy the fiction in my library. I was just wondering how your color coded labels are holding up. I was looking into these for my library, but was concerned that they would peel after a while. Any issues? I was also wondering about the genres for which you have two colors listed. Did you just use two color labels? Thanks for the supply breakdown and the step by step. They are really helpful. The dual-colored labels are striped. I bought them all from either Demco or The Library Store. I covered every label with 1" book tape, and I have had no issues with peeling at all. They are very secure. No fading, either, even though I have huge windows in the library. I have been thinking about this for awhile. You've inspired me to try it. I can see that it would increase the chance of students finding what they want, and isn't that the point? I have already separated out Horror, Sports, and Graphic Novels because these were the most sought after genres, so I am part way there! @Anonymous--That is EXACTLY the point! If students can't find what they want, they won't read what they check out (if they check out anything). Best of luck to you on your genre-journeys--please feel free to ask any questions you might have! I love this article! It doesn't make me feel like I'm insane for attempting this in my elementary/middle library (we are PreK-8). I hear constantly, "Where are the scary books? Where are the books on horses?" So I'm giving in and genre-fying my library. Pray for me! @Annie G--Best of luck to you! Your students will thank you for it! @Kelly--Great question! I actually ask my vendors not to include spine labels. I make my own large-sized spine labels. I have been doing this since before I genre-fied because the Follett labels have such small fonts. I just created a template that I use over and over. If you want a template, just email me and I will be happy to send it! Would you share this template with me as well? I am happy to share the template. Please send me an email to leigh@readerpants.net, and I will send it to you. This is a great idea. I am finishing up my inventory and I think I can begin this type of project this week and continue when I return. I am so excited to start!!! I am thinking of proposing this idea to my administration. I would love to hear if there is any blowback about being able to use a traditional library as students go on to high school and college. Anon Sept 17--I am so sorry--I somehow missed this comment back in Setember. I haven't had much nay-saying personally, but my response is always as long as the students are taught to use an online catalog system, they will be fine in college. There is never a guarantee that the students' college will use the same system their high school did. Personally, my high school used Dewey, but my university and my grad school both used Library of Congress classification. They are similar but not the same. Thankfully, I had been trained to use the online catalog for searches. I have a question concern reorganizing or renaming genres. My library is throwing around combining Mystery/Thriller/Suspense/Horror and SciFi/Fantasy/Paranormal. We are looking for that "perfect" five to seven letter word that would describe the combined genres. Any suggestions? For the Mystery/Thriller/Suspense/Horror--How about just Suspense or Thriller? Or Action? For the SciFi/Fantasy/Paranormal--How about just Fantasy? Speculative Fiction? Other Worlds? This one is harder since these three genres are pretty different, especially if you put SciFi in there. Fantasy and Paranormal could just be Fantasy, but SciFi isn't really Fantasy at all. This post is so helpful! Along with all the comments! I have two goals for the summer and am trying to work out a plan that will accomplish both. I am in a K-8 school. I would like to genrefy the collection, while also establishing spaces in the library for the different patron age groups. If anyone went through a similar process, would LOVE to hear from you! Thanks! This post is GREAT! I will be printing and presenting the idea to our library board for approval. I can't wait to get this started. Thank you for the instructions. I have a K-12 Library so it will be a bit of a challenge, but so worth it in the end when students can find what they really want to read! SO! It's four years since this initial post. How do you feel about this project now? Any additional advice you would pass on that you have learned since this project started? Thanks for your help! I love this question! Four years later, I love it so much that I genrefied a second library. I'm a huge proponent of fiction genrefication of school libraries. The benefits (increased library use/circulation) far outweigh the drawbacks (time and nonconformity). I'm actually working on a book about it! I have been reading your posts and I'm looking at converting my middle school this summer. I would love to get a copy of your book when its published. Thanks for all of your information. I'm Dulwich College in Suzhou, China, and the library is very much supported here. The library is a popular place for teachers, students, parents, and admin. Don't give up on Asia--schools are all different, especially international ones. Actually, I forgot I had a question which is if there's a genre designation for what I think of as YA "problem" novels that focus on, for instance, "suicide" or "homelessness" or "gay family", etc. that are more particular than more general teenage concerns? I'm looking for some specifically YA genres that are more specific than the common crossovers from adult fiction! Great question--I file these with "Realistic Fiction" books in my library, but I've also seen them called "Contemporary Fiction" and "Problem Fiction." I've thought about splitting my Realistic Fiction section (huge) into smaller subsections, but I'm not sure how I would split them. Some possibilities--School Problems, Family & Friends, Abuse & Addiction, Internal Conflict...These entangle so much that I think it would get too complicated to decide what goes where. So for now, I still have a huge Realistic Fiction section. I agree with Mr. G--Goodreads is fabulous! You could also tap into other genrefied library OPACs to see where they put the same book. Feel free to use mine: http://library.dulwich-suzhou.cn. We have a huge collection of many of the latest titles--just look at the call number for the genre I used. Did you alphabetize by author's last name within the genre sections? I have permanent shelving but I think I could make this work! The librarian before me did this ( put books together by genres). At first I was like , this is NOT going to work for me. But now I see the many advantages and it really is helpful for the students! This is so awesome to hear! We genrefied at my current school 2 1/2 years ago, and our circ stats continue to increase over the previous year. Last week, we increased 25% over the same week last year, even though our total school enrollment decreased by about 10%. The week before, we were up 11% over the same week last year. Love genrefication!!!!! I am an elementary school Librarian in Virginia. I learned about genre-fying our collection at a conference for school librarians. Once I received approval from the principal, I started by identifying the genres in our fiction section. Our Graphic novels have their own section at the end of the Dewey Decimal section. After identifying and listing our genres, I made labels depicting each genre and put them on the spine. I used cardboard magazine holders with larger, corresponding identification to separate the genres. our genres are arranged alphabetically-Adventures, Animals, Classics (Tom Sawyer, Oliver Twist, et Al), Fantasy, et.). There has been a lot of book shifting on the shelves and I still have quite a few books left to do, but I have made tremendous progress and I have added genre identification as part of my cataloging procedure. I have awesome fifth graders who love to help put the labels on the spines for me. A few know the process of book circulation, so I can have them take turns checking books in and out so I can work on labeling the books. I love this idea, I am a 1st year elementary librarian/media specialist and will totally be working on this. Thank you! Thank you for the great ideas!!! I have set up a few sections in my library. When I have them in a section, I no longer shelve them by author's last name. I just shelve them into that section. Does anyone continue to shelve by author's last name within the section? I started this process last year and seperated my fiction into 11 catagories. I still shelve by author's last name within the genre. We have too many books and too many series books not to keep that part of the system. I'm in a 6-8th grade middle school in a huge district. When I started this my district was in the process of changing from one cataloging comppany to Destiny. The district wanted me to wait but I knew this was the way to go so I started on my own. Now that we are in Destiny I just change the sublocation to reflect the genre. Now the kids will see the genre location when they look up books on the computer. Until we got this done I was the go to for what genre each book was in. I pulled all the graphics into one group which is so popular with my kids. Classics are still the slightly confusing group. I have a copy of the Outsiders in classics and in realistic fiction; the same for other titles like Sherlock Holmes. But, as long as the computer catalog has the sublocation I feel like that is ok for the time being. Also, for kids who might not be into classics by having some of the titles in multiple areas it offers some options. I loved making this change in our librray and can tell you my stats for checkout have also improved significantly. Plus, walking in the morning and seeing all the beautiful colored labels makes my heart happy.